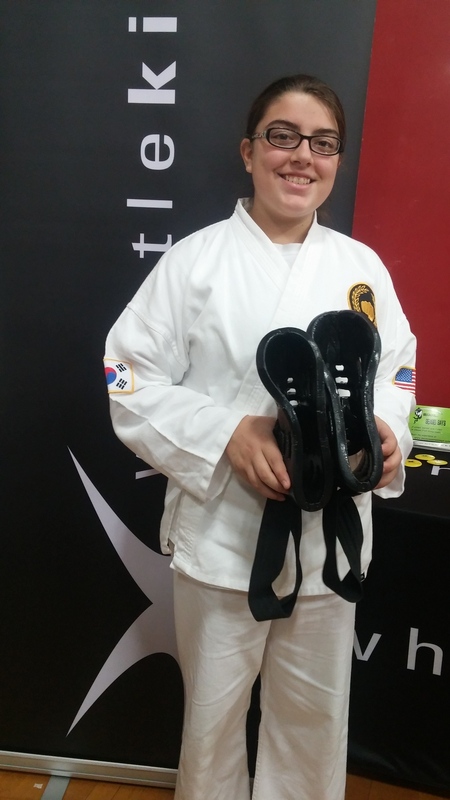 Alyssa Chandler, Green Belt, Age 13, with her 18 month old whistlekick Sparring Boots - and they look brand new! A few weeks ago at the Elm City Karate Challenge I got to chatting with Alyssa Chandler and her Mother. Alyssa is 13 and was at our booth to replace some sparring gear she had outgrown. As often happens when I speak with someone at an event I found out that the gear she had outgrown was gear she had purchased from us a year and a half ago. She and her Mom said quite a few nice things about the gear, including the durability. I asked to see it and they said they'd drop by later in the day to show us how it had held up. I wasn't prepared for what I saw. See, we've had customers using our gear since the debut in January of 2013. As far as I know, it's all held up well, but I haven't been able to put my hands on gear that has been in heavy use for 18 months like Alyssa's. It's important that I point out a few things here. This gear is used, but not abused. Alyssa didn't stuff her shin guards into her boots and then cram those into her helmet. She took care of it, following our suggestions to preserve the life of the gear. The elastic straps, while still in great shape, do show signs of wear. Lastly, there is a small tear in the shin guard in the bottom right of the image - if you zoom way in you can just make it out below the disclaimer. 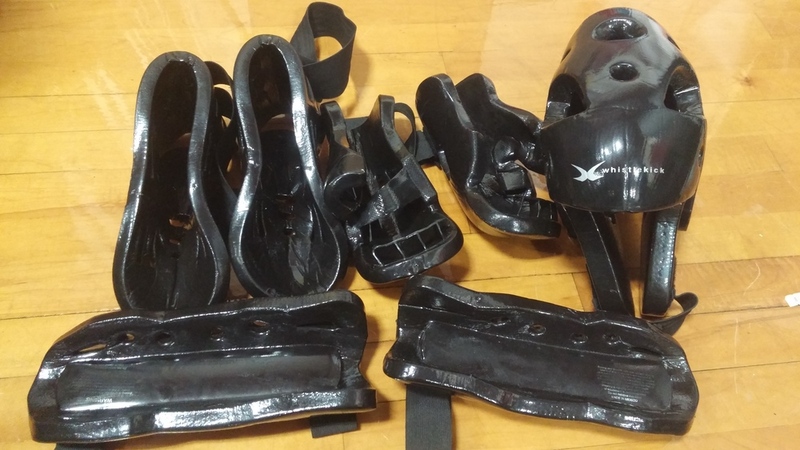 Alyssa Chandler's set of whistlekick sparring gear, 18 months after she started using it. But that's it. While there are wrinkles and certainly signs of use, Alyssa's gear has held up very well. She replaced her boots and helmet but had no issues continuing to use the gloves and shin guards. Seeing how well our products hold up thrills me to no end. While we were at this event we also took a quick look at the gloves and helmets from Christopher and Caleb, twins who first purchased from us in early 2014. They're still using them frequently and they've held up well. Their boots, too. How old does that make their equipment? Their gloves and helmets are now nearly two years old, and they look nearly as good as Alyssa's.